> While this really isn’t the best way to base your training, it is just something I was thinking about. I tend to get random hypotheses and try to run with them but being that I am not in a research lab, the best I can do is try to research and answer my own questions based on others’ results (bear with me, it has been a while since I studied muscle physiology on this level ;p). 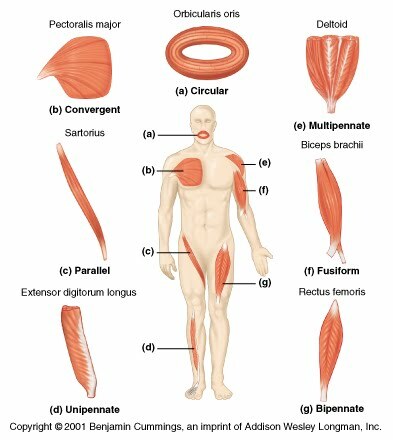 Training according to current levels of pennation is like my thought of if you could actually get each muscle group biopsied to find out which type of muscle fibers you are predominant in for each group and train them according to that, talk about specific training! What if you trained your muscles according to their angle of pennation, for those muscles that ARE pennate muscles, like the rectus femoris? I mean basing your training not on the principle of how hypertrophy increases pennation but based on the levels you already have. (maybe this thought doesn’t even really make sense but it made me wonder so…lol)With muscle hypertrophy from training involving an increase in pennation angles as demonstrated in many studies showing a correlation between these two variables, like Kawakami, Abe & Fukunaga’s tests at the Dept. of Sports Sciences at the the University of Tokyo, Japan, which showed the significant differences between normal subjects and bodybuilders in muscle thickness and pennation angles, this is an interesting thing to consider when designing a training protocol. (1). Pennate muscle has muscle fibers that align obliquely with the tendon and the angle of pennation with the tendon can affect the number of sarcomeres per cross-sectional area and thus the maximal force capabilities (2). Muscles that have a greater pennation tend to have a greater ability to exert force.Really, I suppose my two random thoughts coincide with eachother as they are sort of related. If a higher angle of pennation in a particular muscle equates to a higher generation of force, shouldn’t you train that particular group in the manner you would for force (mass x acceleration), move heavy objects fast? 1.J. Appl. Physiol. 82(1): 354-358, 1997. 2. Hunter, Gary R. (2000).Muscle Physiology. Essentials of Strength and Conditioning,Second Edition (pp.10). Human Kinetics.